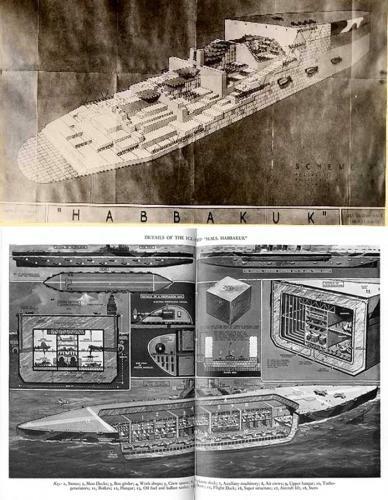 A joint effort between British, American, and Canadian forces during the final years of World War Two, Project Habakkuk endeavored to create a floating aircraft carrier made of frozen water and wood pulp, inspired by the idea of a military base built atop a floating glacier. The project failed miserably but produced some fascinating anecdotes, including one incident in which a bullet shot at a block of Pykrete (the name given to the frozen water and pulp concoction) in order to demonstrate the material’s strength ricocheted around a room containing, among other notables, Winston Churchill and Franklin D. Roosevelt. As tempted as I am to write my own take on this intriguing and at times humorous subject, I must admit that the Wikipedia entry on Project Habakkuk is more comprehensive and well cited than any I could produce. Here is a direct link to the Wikipedia entry. The strange story of Project Habakkuk excites me because it combines grandiose and radically novel ideas, the impassioned efforts of highly capable individuals, the titillating drama of the wartime urgency for the advancing of naval and military technology, the involvement of conscientious objectors, as well as setbacks and failures that are amusingly pitiful. Enjoy.